Is Nigeria still “Fantastically Corrupt”? 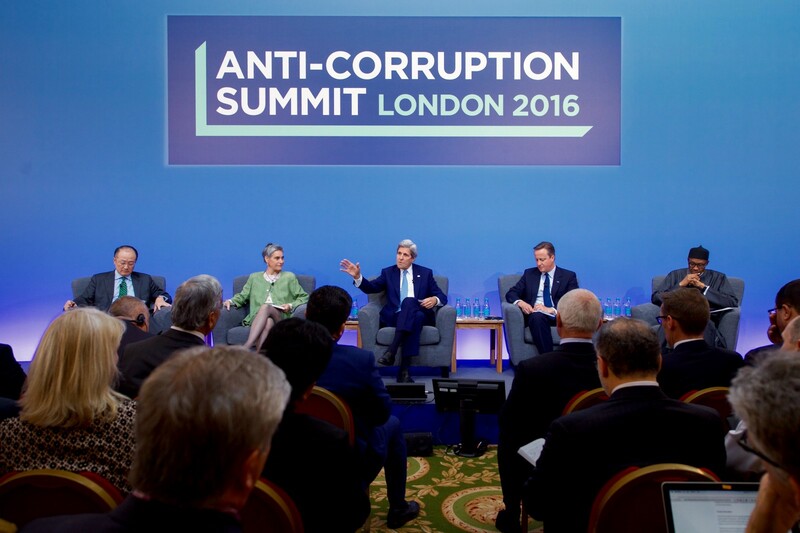 It has been a year since former British Prime Minister David Cameron hosted what many described as a landmark anti-corruption summit in London. Political leaders in attendance committed to make uncovering corruption wherever it exists a global priority, by promoting integrity and encouraging transparency. A major side attraction of the summit was a conversation between the Prime Minister and Her Majesty, the Queen, in which Mr Cameron described Nigeria as “fantastically corrupt”. Due to the wide publicity given to the leaked content, many observers expected that Nigerian President Muhammadu Buhari would boycott the summit. Surprisingly, the Nigerian leader, elected in part because of his anti-corruption stance, was the first to arrive at Marlborough House for the event, where he pledged to fight corruption and announced that Nigeria would officially join the Open Government Partnership (OGP). So, has anything happened in the intervening year? Well, Nigeria has maintained its position as 136 (out of 176) in Transparency International’s Corruption Perceptions Index, but there are many signs that this will soon change. Through OGP initiatives that prioritize citizen involvement, a whistle blower protection policy was recently introduced through which more than 180 million US dollars have already been recovered. It is expected that a register of beneficial owners of companies operating in the Nigerian oil and gas industry will be made publicly available before the end of 2017. And the Nigeria Extractive Industries Transparency Initiative (NEITI) recently announced the discovery of 21 billion US dollars in unremitted funds reportedly held by the National Oil Company, suggesting that the money might have been diverted elsewhere. Despite his recent health challenges, President Buhari has made courageous efforts in reforming the military procurement system, which was allegedly used by the former administration to funnel away public funds. He also suspended Cabinet Secretary Babachir Lawal, who is currently being investigated on suspicion of awarding contracts and accepting billions of naira in kickbacks, as well as diverting monies intended for victims of the Boko Haram insurgency. With the current oil price at below $50 per barrel, Nigeria is struggling to overcome a recession. Unemployment is at 13.9 percent, underemployment at 19.1 percent, and inflation at an all-time high of 17.1 percent. It is hoped that the fight against corruption will support Nigeria in its attempts to improve its business environment, boost the non-extractives sector, and bring in additional foreign exchange earnings. Clearly, there is a lot still to be done to clean up the ‘opaque’ nature of Nigerian politics, which remains largely transactional and self-serving. The cost of politics in Nigeria is one of the highest in the world, putting pressure on public office holders to see political careers as opportunities not to deliver service, but to recoup their investments and make profit. By fighting corruption, we hope to connect to the day-to-day needs of ordinary people and create tangible positive advancement of Nigeria’s economic reality. How many other countries can say the same?